Bacopa, also known as Brahmi, is a low-growing perennial (annual in our climate) native to India, and has its traditions in Ayurvedic medicine, a healing system developed thousands of years ago in India. One of bacopa’s primary mechanisms is in enhancing cognitive function, and has been used in Ayurveda as a brain tonic to enhance the development of memory, learning, and concentration. In clinical studies, it has been used to provide relief to patients with anxiety, epilepsy, and insomnia. Aside from increasing intellectual function, bacopa induces a sense of calm, reducing the effects of stress and nervousness. Additionally, bacopa has also been used to treat digestive ailments, as well as skin and bronchial ailments, including asthma, eczema, psoriasis, abscesses, ulcerations, and constipation. 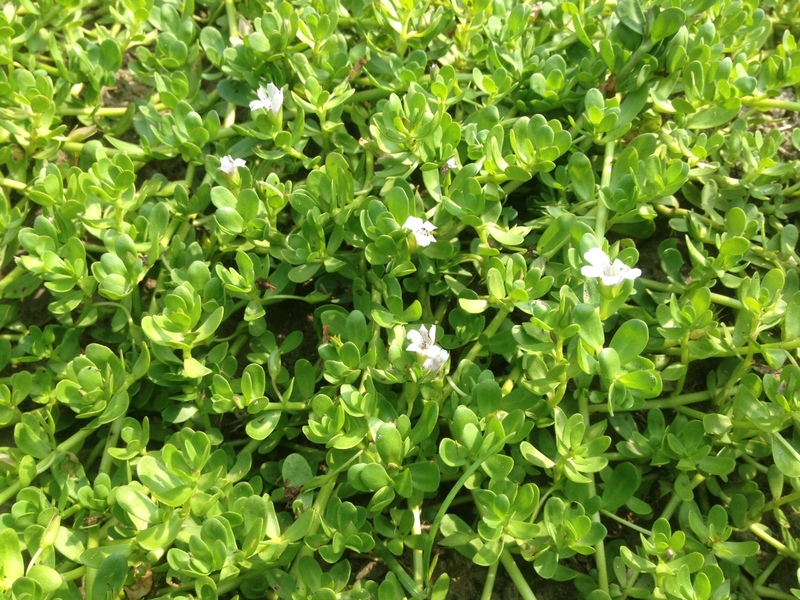 These effects are perhaps due to the bitterness of bacopa, the taste of which stimulates the excretion of digestive enzymes throughout the digestive tract, as well as bile from the liver. Support of these primary eliminatory organs, in turn, supports the healthy release of toxins through secondary eliminatory organs, including the skin and lungs. Further, bacopa has been shown to possess anticancer and antioxidant properties. The entire plant can be used medicinally. It can be prepared as an alcohol extract using the fresh or dried plant. It can also be dried, ground in a blender and taken in capsule form. We also dry it whole and then use it in teas, in combination with sweeter, more delicious herbs to help balance out the bitterness. In India, it is often prepared in salads, soups, and as a cooked vegetable but as you will find out, it is quite bitter and we have yet to cook with it. We recommend tincturing the fresh plant in alcohol and setting it aside to combine with other herbs for a brain tonic formula. Herbs like: rosemary, skullcap, ginkgo, lemon balm, tulsi and ashwagandha. Herbalist Maria Noel Graves has a nice article on brain tonics online here. Cautions/Contraindications: Some may experience increased peristalsis and intestinal upset.